As you can see, these locomotives are not turning left just yet. Whether it’s a right turn or a left turn depends on which direction the trains are going. 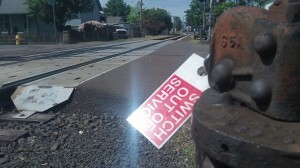 But it will be a few more weeks before they use a new Albany track to turn either right or left. That’s the word from Kevin R. Haugh, the general manager of the Portland & Western Railroad. 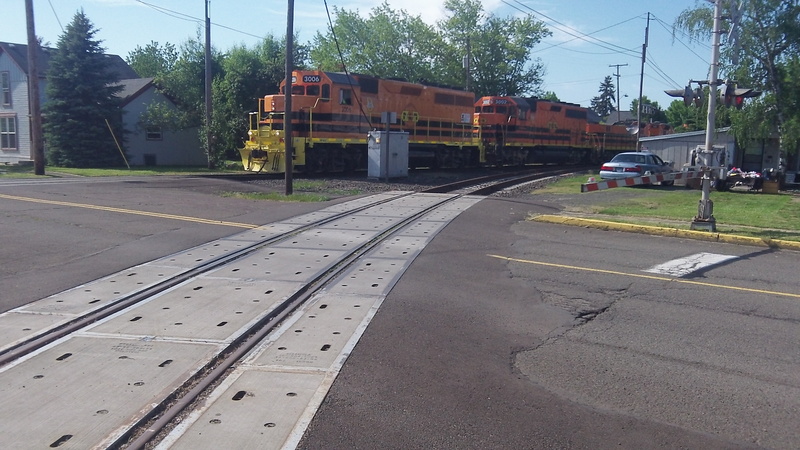 Under an agreement signed in June 2009, the state gave the railroad a grant of $6,990,516 under the Connect Oregon II program for constructing a short section of new track between Madison and Main Streets, known as the Santiam Lead, and for related work on the Y-shaped track known as the Albany Wye. This was to allow trains to go from the Toledo Branch directly to the Millersburg yard without having to enter the Union Pacific mainline. It was supposed to let the railroad move more of its switching from the Albany to the Millersburg yard, resulting in the Queen Avenue crossing being blocked less often. Switch for the left turn remains out of service.